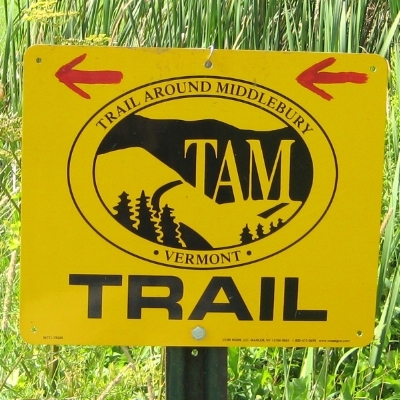 It has been years since I've been back to Middlebury, Vermont to run the circumnavigation of the town known as the Trail Around Middlebury, so when I learned that a bunch of folks would be gathering for the 11th annual TAM Trek, I couldn't pass up the opportunity to join them. So this morning I joined about a dozen participants, starting from the ridge overlooking the Middlebury College football fields and golf course, and after a brief description of the course and a group photo, the event director shouted "Go!" and we were on our way. We ran the course clockwise, winding initially through pastures (with feet soaked most of the way) mostly along fences, where the "trail" was essentially the closer-cropped mowed strip next to fields of tall grass. The trail is mostly well marked with yellow markers, though there weren't any markers at the park at about mile 8.5 before the climb up Chipman hill, so I backtracked a bit before figuring out that this is the spot where one must run along the road for a while. Chipman Hill vista, taken by Jeff at The Middlebury Trailrunner blog. The section up and down Chipman Hill was my favorite of the course: great woodsy scenery, some nice views over the Champlain Valley. It is also one of the more technical sections of the course, with lots of roots and a few rocks, so of course I took a tumble on my way down. After dusting myself off, though, all was well and I continued on my way. The second spot where I took a wrong turn, it was for the opposite reason as the park section: instead of there being too few yellow markers, there were actually too many! Not long after crossing Route 7, I came upon a section of trail where seemingly every direction had yellow markers, some of them labeled "school-short way," "school-longer way," "Rte 7," and so on. I knew I didn't want to go back to route 7, which I'd only just crossed, but I also didn't think I wanted to go to the school. In search of a plain "TAM" continuation marker, I headed uphill to try to get a better view. After poking around for a while I realized by process of elimination that the school must be the right way to go. This section of the TAM is a little tough to follow; I had to backtrack after missing a TAM marker near a busy constriction site, and parts of the TAM here go through parking lots or along sidewalks. There are two cool features along this section, though: a suspension bridge over the Otter Creek, and an actual railroad crossing. That's a first for me! I ran into two of the Lynn sisters who have moved back to Vermont in recent years and who now run newspapers in the area. As we chatted, the final few miles rolled by, and they both knew the route well enough that we didn't take any wrong turns after that. I should definitely have studied the map before doing this run, as the signage wasn't enough for me to have trouble-free navigation. 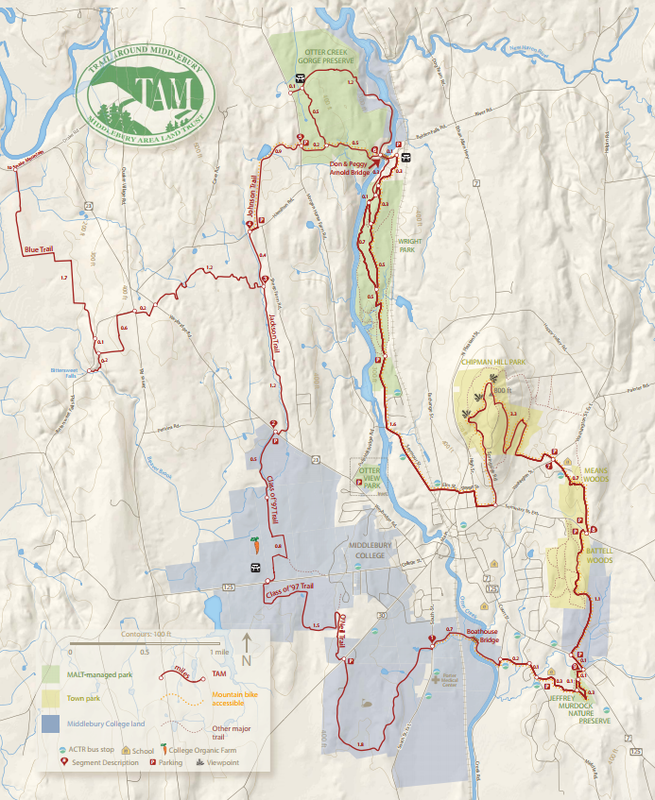 But if you're interested in seeing a Vermont gem that shows off pastureland, forests and hills, it's hard to go wrong with a run on the TAM!